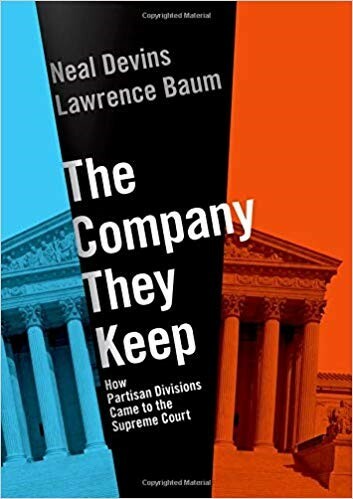 The following is a series of questions posed by Ronald Collins to Neal Devins and Lawrence Baum on the occasion of the publication of their book “The Company They Keep: How Partisan Divisions Came to the Supreme Court” (Oxford University Press, 2019, 272 pp., cloth: $29.95). Neal Devins is the Sandra Day O’Connor Professor of Law at the College of William and Mary. Lawrence Baum is an emeritus professor of political science at Ohio State University. Welcome, Neal and Lawrence, and thank you for taking the time to participate in this question-and-answer exchange for our readers. And congratulations on the publication of your latest book. Question: The two of you make use of political science and social psychology in writing about the Supreme Court and its decision-making process. How does this book differ from your previous works? Devins & Baum: This book is an outgrowth of previous work. 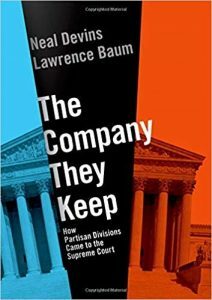 One of us (Devins) wrote about political ignorance and the inability of the general public to directly engage with the Supreme Court; the other (Baum) wrote a book, “Judges and their Audiences,” that explained the importance of social networks to judicial decision-making. “The Company They Keep” builds on our past work. It explains the nexus between Supreme Court decision-making and increasingly polarized elite social networks. It relatedly debunks claims that the justices follow public opinion. Who, in brief, are these elites and why are they more influential than popular majorities? Devins & Baum: In broad terms, the elites that may be relevant to justices are those who have achieved high political, economic and social status. The worlds in which future and sitting justices live and work are composed primarily of elites, so justices identify with them. The specific elites that are important vary from justice to justice, but elite segments of the legal profession and groups with a liberal or conservative orientation are often part of what social psychologists would call a justice’s social identity. Like other people, justices consciously or subconsciously seek the approval of people and groups that are important to them. Thus, elite groups can exert a subtle influence on a justice’s judgments. While justices may have reason to seek approval from the general public, they have a more fundamental motivation to win and maintain the approval of the people who are more important to them personally. Question: Do justices ever shift their allegiance from one category of elites to another? For example, did Justice Harry Blackmun shift from conservative elites to liberal media elites? Devins & Baum: When people’s situations change, so may their social identities. Whether or not Blackmun identified with conservative elites when he joined the Supreme Court, it seems clear that the approval of liberal elites in the legal profession and the news media – along with the disapproval that he received from other quarters after Roe v. Wade – reinforced his gradual movement to the left. In effect, his social identity became linked to liberal elite groups. Some conservatives have argued that several Republican appointees to the court became more liberal during their tenure as justices because of the influence of those liberal elites. While the validity of that argument can be debated, it certainly should not be dismissed out of hand. Question: When it comes to issues such as abortion, affirmative action, gun control and health care, is there really such a thing as a rule of law divorced from partisan predilections? Devins & Baum: Yes and no. No, because Democratic and Republican justices typically disagree on these issues, these disagreements will persist so long as there is elite polarization, and they inevitably shape the justices’ positions in cases. Yes, because Democratic and Republican justices are both committed to norms of judicial independence and collegiality. These norms are relevant in two ways. First, the justices will look to act in ways that suggest they are above politics – by avoiding politically divisive cases and issuing narrow consensus opinions on which party line divisions are not apparent. These norms, moreover, speak to respect for precedent, and some justices will be loath to formally overrule politically divisive decisions. Second, the justices understand that they must set forth their reasoning in written opinions that will be subject to critique by academics, fellow judges and others. Individual justices will seek to issue principled opinions, that is, opinions that reinforce their jurisprudential vision and can be seen as well-reasoned against the backdrop of other decisions they have issued or will issue. Question: You point out that when it came to some of the Warren Court’s more expansive rulings, as in the criminal justice realm, the divisions among the justices were not explainable by partisan politics drawn along party lines. Similarly, you note that the majority on the Burger Court in Roe v. Wade consisted of five Republican appointees and two Democratic appointees. Can you say a few words about that and why today the situation seems so different? Devins & Baum: Before Ronald Reagan, party identity and ideology were linked only to a limited degree. Conservative Southern Democrats and liberal Rockefeller Republicans were critically important to their respective parties. Correspondingly, since party and ideology were not strongly linked, Democratic presidents often named conservatives to the Supreme Court and Republican presidents often nominated liberal justices. Indeed, it was not until the 1991 nomination of Justice Clarence Thomas that Republican nominees have uniformly been more conservative than their Democratic counterparts. Moreover, the conservative legal network that is so important today was nonexistent at that time. Legal elites during the Warren and Burger Court era were mostly liberal, and perhaps as a result, several justices drifted towards liberal views once on the court. Decisions like Roe and Miranda v. Arizona reflect these phenomena. Question: You make a strong case as to how political polarization and influence by certain elite groups shape the justices’ opinions and voting, at least in cases involving controversial political and cultural issues. In that regard, it seems that the justices would be far more likely to split in those controversial cases than in other cases. If that is indeed so, then might we understand the law as interpreted by the Supreme Court as being bifurcated? That is, one track of law is likely to be more partisan (or political) and the other track more likely to be neutral (or rule-of-law like). Do you agree? Devins & Baum: The idea of two tracks makes a great deal of sense. In a polarized political world, even more than at other times, justices are pulled toward the positions of conservative or legal elites in the cases that have high ideological or partisan stakes. At the same time, the justices want to think of themselves as skilled lawyers, and they want legal academics and other commentators to see them as being devoted to the law. So in cases that have minimal ideological and partisan stakes, justices can act more as neutral interpreters of the law. This tendency to put cases into two tracks helps to account for the high proportions of unanimous decisions as well as the decisions that divide justices along non-ideological lines. Question: Your focus on the influence of elite groups on Supreme Court decision-making diverges from how constitutional law is generally taught in law schools. That is, your book seems to counsel law students to be skeptical of so-called neutral approaches like textualism and ad hoc balancing. Is that a fair assessment? Devins & Baum: That is a fair assessment. Justices who espouse textualism, to take one example, almost surely believe that they are following a neutral principle. But justices and others who adopt such principles do so largely because they think that the principle will usually lead them to the outcomes they prefer on ideological grounds. In addition, the path from any such principle to decisions is often uncertain, and that uncertainty leaves room for justices’ policy preferences to come into play when they apply principles such as textualism. Two questions: (1) What do you make of the chief justice’s remarks? and (2) given what you write in your book, is it possible for him to scale back the partisan divide that has captured the court when it comes to hot-button issues? Devins & Baum: Chief justices in general and this chief justice in particular care a great deal about institutional concerns, particularly the Supreme Court’s independence and legitimacy. Starting with his confirmation hearing and throughout his tenure, Roberts has presented himself as committed to the court’s reputation as “neutral umpire.” Relatedly, he prefers consensus-based minimalist opinions to sharply divided opinions. And while the chief justice does not always practice what he preaches, it is, nonetheless, true that the growing belief that the court is partisan cuts against this rhetoric and the chief justice’s personal legacy. It is little wonder therefore that the chief justice would take issue with Trump’s remarks, and his response is very much in keeping with his ongoing campaign to present himself as steward of a court committed to the rule of law. As to whether he can scale back the partisan divide, rhetorical statements are useful but the rubber meets the road with his decisions and opinion assignments. By steering the court away from divisive issues and by assigning opinions in ways that facilitate consensus, the chief justice can make a difference. How much of a difference remains to be seen. How do the justices’ votes in this case square with your understanding of elites and partisan divisions on the Supreme Court? Devins & Baum: The justices’ positions in any specific case may result from a variety of considerations. In Gee, Kavanaugh voted with Roberts and against the other three conservative associate justices; 11 days later, in Trump v. East Bay Sanctuary Covenant, Kavanaugh joined those associate justices and diverged from Roberts in voting to stay a district court decision that blocked the federal government from denying consideration for asylum to people who entered the country illegally. We think the key difference is likely between the chief justice and the other four conservatives on the court. Question: Kavanaugh’s views on statutory interpretation and administrative law – specifically, his objection on separation-of-powers grounds to the growth of the “administrative state,” which he has called the “headless fourth branch” of the government – have drawn attention. If this were to become the next hot-button issue, do you suppose it would play out the same partisan way as other controversial areas? Devins & Baum: No. The division on issues of separation of powers and statutory interpretation seems somewhat different from the division on socially divisive constitutional issues. Because Democrats and Republicans control Congress and the White House at different times, broad or narrow views of presidential and agency power do not necessarily favor the political objectives of one or the other party. And while Republican appointees are more apt to disfavor agency power, the Supreme Court’s division on separation of powers is not sharply partisan – at least for now. In Zivotofsky v Kerry, for example, Justice Anthony Kennedy and Thomas broke from the court’s other Republicans in a case regarding the respective powers of Congress and the president to recognize foreign nations. Gorsuch also broke rank from the court’s Republicans in a statutory interpretation case concerning the government’s power to deport immigrants who commit serious crimes. These cases suggest that issues of presidential power and statutory interpretation may roll out differently than abortion, affirmative action and socially divisive constitutional issues. Question: How does the question of legacy fit into your calculus of Supreme Court decision-making? That is, what if a justice is more concerned with buttressing his or her legacy than with pleasing the partisan elites of the day? Devins & Baum: Supreme Court justices are not immune to the strong human tendency to focus on the short term and, consequently, justices rarely vote against strongly held legal policy preferences in order to advance abstract long-term goals such as legacy. Then again, justices may give some weight to their long-term legacy when they address certain cases. That may have been true of Justice Antonin Scalia, for instance. Chief justices have especially good reason to think that they will be remembered long after their tenure on the court ends, and that feeling may help to explain Roberts’ desire to avoid the image of his court as one driven by partisan considerations. Question: You write that Gorsuch is likely to remain true to the creed of conservative elites. Do you think the same will hold true for the chief justice? Or would his case become more complicated were four justices to form a consistent hard-liner conservative voting bloc? Devins & Baum: We think it is important that Gorsuch – like Thomas, Alito, and Kavanaugh – has strong ties to conservative elites generally and the Federalist Society specifically. In contrast, Roberts has kept some distance from that movement, and from the Federalist Society, since his appointment to the court. One powerful reason, we think, lies in the justices’ perceptions of their audiences. It appears that Roberts sees his reputation and standing as depending largely on preventing the Supreme Court from being seen as a partisan institution, while the four associate justices care more about how they are viewed by their fellow conservatives. The more that the other conservatives form a consistent bloc, while liberals form an opposing bloc, the greater will be Roberts’ incentive to diverge from conservative positions in certain cases and to try to move his colleagues away from bloc voting through means such as identifying compromise positions. If a sixth conservative joins the court, however, that incentive might weaken. Question: In your conclusion you are rather pessimistic about the court being able to move beyond the ideological divide. If that is so, and if the conservative bloc of the court holds or even increases its power, then at least two liberal alternatives present themselves: (1) a return in the liberal legal academy to James Bradley Thayer’s minimalist view of judicial review, or (2) at the political level, an embrace of some form of court-packing plan if the Democrats regain the presidency and control of Congress. Devins & Baum: We doubt that modern day court-packing proposals will gain favor. There is near-universal disapproval of FDR’s plan to add justices in order to overcome court hostility to the New Deal reforms. And while the backdrop to modern day proposals is different, it will be hard to overcome the disrepute of FDR’s proposal. Nonetheless, minimalism has an excellent pedigree and has been embraced by Republican appointees, most notably, Roberts. We anticipate that the chief justice will sometimes embrace narrow minimalism in order to seek to build a bipartisan consensus. However, on issues on which the chief justice has strong legal policy preferences (affirmative action, for example), we anticipate that Roberts will back maximalist rulings – even if those rulings divide the court’s Democrats and Republicans.